Buster Posey is a statuesque former MVP that handles one of the league’s best pitching rotations. Eric Sogard is a slick-fielding platoon infielder that looks like he’d be more comfortable playing Quidditch. 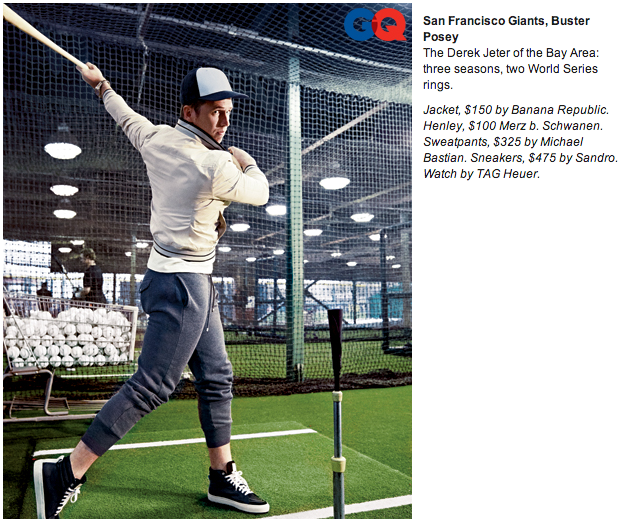 Posey poses in GQ Magazine. Sogard wears vision-correcting eye wear. Which one should be considered the face of Major League Baseball? The fans say Sogard. And it’s not even close, according to the current voting results. Very few people outside of the Bay Area have heard of Sogard. He’s not the type of player that will even be selected in the deepest of fantasy baseball leagues. Yet, he has demolished the competition in MLB.com’s “Face of MLB” competition, which is a tournament style contest that is determined exclusively by fan voting. A’s and Giants fans are currently going head-to-head on Twitter in a battle to get their player to the next round. To vote, all you have to do is tweet either #BusterPosey or #EricSogard and include #FaceOfMLB. Voting closes at 5 a.m. Tuesday morning. Sogard scored upset wins over Anthony Rizzo of the Cubs and Troy Tulowitzki of the Rockies. He is facing Posey in the elite eight round. The improbable run of the bespectacled infielder figured to end when he went up against the Giants’ catcher, but the results have been surprising. Ironically, a guy that nobody would consider the face of his own team, has a chance to advance to the final four. The contest itself is a bit ridiculous, and in true underdog fashion, A’s fans are thumbing their nose at the establishment and loving every second of it. There’s still a lot of time remaining, though, and Giants fans are a force to be reckoned with. It’s likely the battle between fan bases will go down to the wire.